We are highly experienced bulk fuel sales professionals who take the time to understand, meet and exceed the needs of our customers. Our volume purchasing power translates into highly competitive pricing for all our clients. This, along with our service excellence, makes us a leader in the industry and a valued asset to our customers in Manitoba, Saskatchewan and Northwest Ontario. 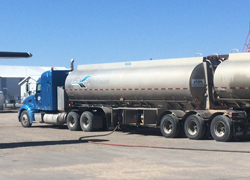 All forms of petroleum products are available for purchase in bulk or in drums. We deliver year round via air, ground (including over winter roads), rail or barge. We can take care of all your logistics, or you can use your own carrier for transport. We also supply and install storage tanks.